We are talking about kitchens, all day everyday, with clients, fellow designers, fellow contractors, vendors, friends….it is what we do after all! And we have read a ton of articles about what is “hot” in a kitchen now! There are tons of opinions and plenty of debate. All ideas and thoughts are great, but we hear one, constant and VERY real common thread in every conversation we have about a kitchen. And it is: STORAGE! We titled this article “Trend” but storage is truly a life changing, must need element in any home design project. There are endless ways to accomplish this trend. Some are unique, some are standard, some are personal but all are important. You can leaf through our past article on this subject, but in the next few weeks, we will be featuring some fantastic kitchen storage ideas. Most can be incorporated into your existing kitchen cabinetry. If you are not up to a DIY project, give us a call and we can help you out! 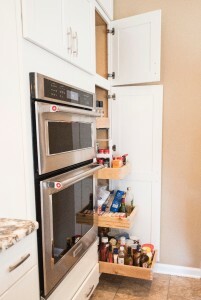 Roll outs in a tall storage pantry for the kitchen. This entry was posted in Designer's Journal and tagged Bryn Mawr kitchens, kitchen renovations on January 6, 2016 by Steph Gillin.